PlayFrank Casino may not be the best-known or biggest casino online. But they offer a versatile and exciting online casino gaming experience for players in the UK. A lot of that excitement stems from their ability to dish out daily challenges, and tasty bonuses. However, this casino – which launched in 2014 – also offers over 1,500 games. And quick payment methods with no fees, and features an innovative reward program. Claim welcome bonus now! PlayFrank is licensed by the MGA (Malta Gaming Authority) and the UK Gambling Commission, just like any top UK casino site should be. They are owned and operated by EveryMatrix NV and offer mobile and instant play casino gaming. 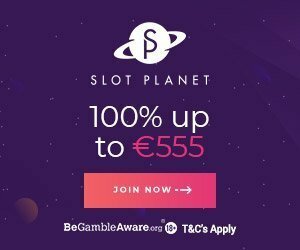 If you were to choose to sign up and join PlayFrank Casino, you could snap up a 100% bonus which is worth up to £100, as well as 50 free spins as a new player. Why Play At PlayFrank Casino Online? With over 1,500 games in their arsenal, PlayFrank Casino should be able to offer players precisely what it is that they are looking for. The casino’s range of games spans slots, classic slots, table games, live casino, jackpot games and more. If players don’t wish to peruse the games via the genres provided, they can always search for a title directly using the search box provided in the lobby. Casino games are provided by quite a few developers, including the biggest and best in the business. 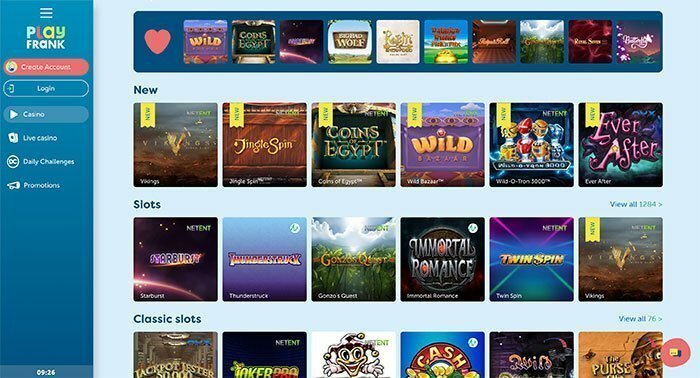 Players can expect to find games from the likes of Net Entertainment, Microgaming, Evolution Gaming, NYX Interactive, WMS Gaming, Novomatic and Greentube, Quickspin, Playson and Habanero. Over 140 table games can be found at PlayFrank Casino, and these span all of your favourites, including roulette, blackjack, oasis poker, TXS hold’em poker, craps, and a good deal of other casino classics. Of course, live dealer versions of many of these games can also be played, with software provided by Evolution Gaming. These live dealer games come with many different table limits. Allowing PlayFrank to cater to players operating on all sorts of budgets. Slot machine games do form the main gaming library at this casino. They include fruit machines, video slots, and both progressive and non-progressive jackpot titles. 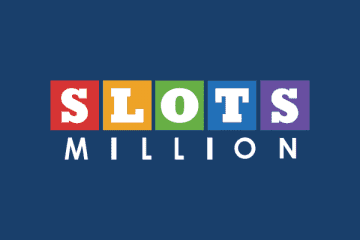 Players hoping to try and win vast sums of cash will no doubt find titles such as Mega Fortune, Hall of Gods and Major Millions ideal, with their multi-million-pound progressive jackpot prizes. If you are a BINGO fan check Mecca Bingo or Gala Bingo! As for big, non-progressive jackpot slots, games such as Vikings, Gonzo’s Quest, Jingle Spin, Wild Bazaar, Starburst, Vikings Go Berzerk, Twin Spin, Dead or Alive, Jumanji, Hidden Valley, It’s Magic, Coins of Egypt, Jackpot Jester 50,000, and Golden Fish Tank could all do a job for players at PlayFrank Casino. They also have a smaal selection of scratch cards online. Like many top UK casino sites, PlayFrank Casino aims to make things as easy as possible for all of their mobile casino users. To that end, players are not required to download any apps. Just play at the casino on smartphones and tablets. Instead, popping over to the casino in your iOS or Android device’s web browser is more than enough to access this casino’s website and games, with a download-free experience open to all. PlayFrank Casino offers two main methods of obtaining customer support. You can use their live chat option (accessible from the bottom of every page and game) to obtain speedy live support and assistance. Alternatively, players can check out the FAQ guide which can be found at the bottom of the lobby. This covers most of the fundamental aspects of gameplay at the online casino and is an invaluable resource for players with more straightforward queries. Social media assistance is also available via PlayFrank’s Facebook page. 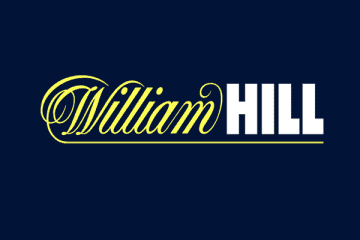 The casino is licensed out of Malta and the United Kingdom, two of the safest gambling jurisdictions a casino can be licensed from. Payments are processed by MoneyMatrix Ltd, and the casino is secured with SSL (secure socket layer) encryption technology. There can no doubts that PlayFrank is a safe casino to play at. Other top UK casinos are 21 Casino and Casilando. The online casino uses the GBP currency, making UK players feel at home. This currency option can be used when depositing via VISA, MasterCard, Skrill, Neteller, Paysafecard, Trustly or Zimpler. All of the deposit methods served up at PlayFrank Casino offer instant transaction times. A minimum deposit limit of £20 is in place. And players are at liberty to select daily, weekly or monthly deposit limits if they wish. Withdrawals can be made using most of the options mentioned above. Of course, some options are speedier than others when it comes to transaction times. Generally speaking, withdrawals take between 3-5 days to arrive in your account, although e-wallet withdrawal methods may shave a few days off that timeframe. PlayFrank Casino doesn’t charge any fees for withdrawals. After choosing to sign up and play at PlayFrank Casino, new players are invited to claim a 100% match deposit bonus on the very first deposit they make. This offer is worth up to £100 in total. It also comes with 50 bonus spins on top slots at the casino. The wagering requirements on this offer are set to 35x for the bonus cash, and 40x whatever you win with the bonus spins. Those playthrough rates are around about the industry standard for such offers. Also check other casino bonuses. Daily challenges are an essential part of the promotional setup at PlayFrank. Players can fulfil these challenges to snap up free spins and other goodies. 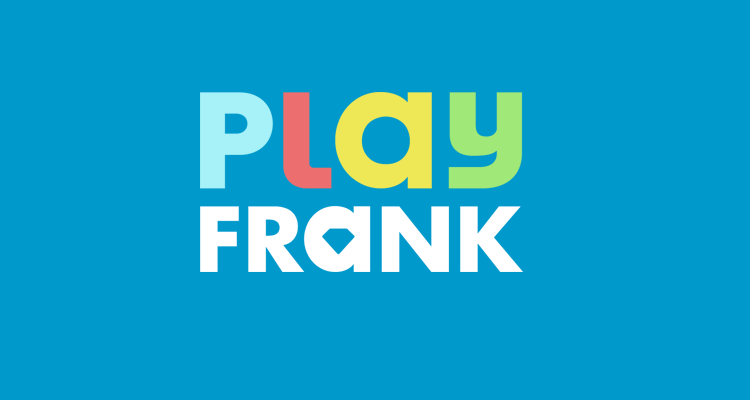 Alongside those deals, there is a reward program at PlayFrank which is second to none. The online casino dishes out rewards based on your gambling habits and activities. The more you wager and play, the more you’ll be rewarded from the casino. Prizes can include free spins, cash deposit bonuses and more goodies. Levelling up certainly has its perks when playing at this casino site. Each of these rewards may also come with additional wagering requirements, so players are advised to read the terms and conditions of any deals they consider claiming via the loyalty bonus program.